Heat the oil in a medium saucepan over medium heat. Add the onion, celery, garlic, chili powder, and cumin, and cook until the onion softens, about 5 minutes. Add the chicken broth, bring to a boil, reduce the heat slightly, and simmer, uncovered, for 10 minutes. Add the green chiles, posole, tomatoes, and oregano and cook for another 5 minutes. Pull the saucepan from the heat and stir in the chicken, cilantro leaves, and lime juice. Season, to taste, with salt and pepper. Serve hot. Looks YUMMY ! Do you think it would be ok without the green chiles ? I can't get them here ... what could I substitute ? hmmm...that really stinks that you can't get chiles there! It's almost the very ingredient that makes this "mexican." I might have to send a care package your way! hee hee...You can send canned food to Australia right? Can't wait to try this, and I always cook from recipes that someone else invented! One tip from Dr Oz's diet is to keep soup in the fridge for a snack. This will become a snack soon in our fridge! I have never seen poblano peppers. I'll have to search around at the fruit and veg stores. Mexican isn't very popular here so the ingredients aren't readily available. It IS improving ... we can now get more than one brand of flour tortillas ! So glad you enjoyed it Mr. Jim. We had it last week and I ate it as leftovers for two days after! One of my all-time favorite soups! Had some of this for lunch. It was spicy and magical! Yuuuuum. 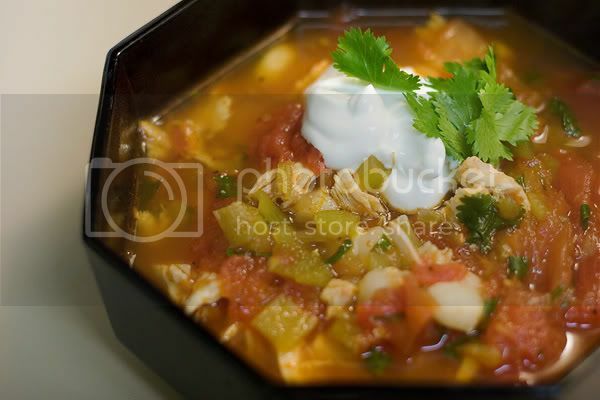 As you see from the comments from our household, I made this soup, with great success! I echo all their comments, and have moved the recipe from the "to try" folder to the "definitely make again" folder! Ok ... I'm making this soup tomorrow night. Do I need four tomatoes out of a can or do I need four cans of whole tomatoes ?